This chapter uses the most recent version of Job Demands–Resources (JD-R) theory to explain how working conditions influence employees, and how employees influence their own working conditions. We show how employee self-undermining activates a loss cycle of job demands, strain, and negative behaviors over time, whereas employee job crafting activates a gain cycle of job resources, work engagement, and positive behaviors. Moreover, we argue that employee well-being and organizational behavior is a function of factors located at different levels (i.e. organization, team, individual level), which influence each other within and over time. 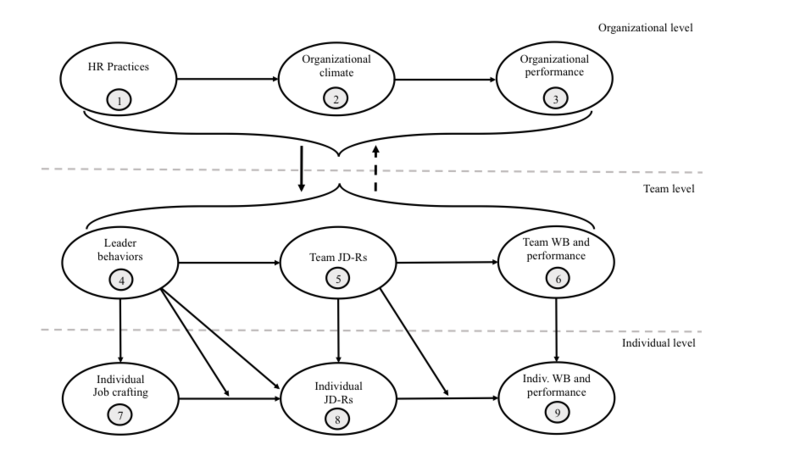 We propose cross-level interaction effects of organization-level initiatives and leader/employee behaviors on team and individual well-being and performance. Although JD-R theory provides answers to many questions regarding employee well-being and performance, we discuss several issues that deserve research attention. The chapter closes with practical implications. We discuss how managers and supervisors can help employees to avoid health problems and flourish at work. Occupational well-being is gaining momentum because managers, policy makers, and employees have started to realize that occupational well-being is a crucial determinant of human functioning and job performance (De Neve, Diener, Tay & Xuereb, 2013). Our knowledge about well-being at work comes from thousands of studies among the various stakeholders in organizational life: employees, their supervisors, HR managers, work teams, and clients. High-quality studies use multiple sources of information to investigate the predictors and outcomes of occupational well-being. In the past decades, we have created a rich knowledge base about the psychosocial factors in the work environment that are responsible for the experience of job stress or well-being, as well as organizational behavior. We know now which job demands and resources predict employee well-being and have an impact on performance (e.g., financial returns, absenteeism, client satisfaction) (e.g., Bakker, Demerouti, De Boer & Schaufeli, 2003; Xanthopoulou, Bakker, Demerouti & Schaufeli, 2009a). However, one important problem of the current literature is that the vast majority of studies in occupational well-being follow a relatively simplistic stimulus-response model; assuming that employees are passive and simply react to the working conditions they are exposed to. In the present paper, we use the most recent version of Job Demands–Resources theory (Bakker & Demerouti, 2014; 2017) to explain how working conditions influence employees, and how employees actively influence their own working conditions. We argue that organizational life should be modeled at the various levels (organization, team, individual), which influence each other within and over time. In this way, we can start to understand the stable and dynamic properties of occupational well-being. Moreover, it is important to model the cross-level interaction effects of organization-level initiatives and leader/employee behaviors on team and individual well-being and performance. Using this multilevel approach, we can explain how managers and supervisors can help employees to avoid job stress, and enhance well-being and job performance. Since the end products of modern labor are so diverse that they range from the optimization of search engines to the provision of personal health care, it is obvious that working conditions can differ dramatically between organizations. Despite these differences, Job Demands–Resources theory (Bakker & Demerouti, 2014; 2017; Demerouti, Bakker, Nachreiner, & Schaufeli, 2001) proposes that all job characteristics can be classified in two main categories – namely job demands and job resources – that have unique properties and predictive value (Proposition 1). Job demands are the aspects of work that cost energy, like workload, complex tasks, and conflicts. Whereas workload and complexity can be qualified as challenge demands that help to perform well, conflicts are hindrance job demands that undermine performance (LePine, Podsakoff, & LePine, 2005). Job resources are the aspects of work that help employees to deal with job demands and achieve their goals. For example, performance feedback, social support and skill variety are motivating job characteristics that provide meaning to employees, and satisfy employees’ basic psychological needs, namely the needs for competence, relatedness, and autonomy (Deci & Ryan, 1985). Job demands and resources have unique and independent effects on employee well-being (Proposition 2). As already proposed in the original version of the JD-R model (Demerouti et al., 2001), job demands may initiate a health-impairment process if exposure to daily workload transforms into chronic overload over a long time period. In this case, job demands lead to chronic exhaustion and may eventually result in physical health problems (including cardiovascular diseases). In contrast, job resources initiate a motivational process. Since job resources provide meaning and satisfy people’s basic needs, job resources are motivating and contribute positively to work engagement (i.e. a fulfilling state of vigor, dedication, and absorption; Schaufeli & Bakker, 2004). Proposition 3 of JD-R theory is that job resources can buffer the impact of job demands on negative strain. Thus, even though job demands and job resources have clear and independent main effects, they also work in concert (see Figure 1). Job resources are instrumental in that they arm employees with the means it takes to cope with the job demands. Whereas some scholars have argued that job resources should match the specific job demands – for example, that emotional job demands need to be matched with emotional job resources (De Jonge & Dormann, 2006), our research has shown that various job resources can buffer the impact of various job demands on negative strain (e.g., Bakker, Demerouti & Euwema, 2005; Bakker, Van Veldhoven & Xanthopoulou, 2010; Xanthopoulou et al., 2007). Figure 1. The Job Demands–Resources model. Proposition 4 brings the JD-R theory one step further as it suggests that job resources particularly influence motivation and work engagement when job demands are high. Thus, autonomy, skill variety, performance feedback, and task identity become particularly important when the job demands are very challenging. This idea is consistent with Hobfoll’s (2001) notion that all types of tangible or psychological resources gain importance and become particularly useful when needed. Particularly when employees are confronted with a high workload and with emotionally demanding clients, they can use their autonomy, skills, and sense of prosocial impact to deal persistently with these demands and choose the right approach. Indeed, our research among Finnish teachers and dentists (Bakker, Hakanen, Demerouti & Xanthopoulou, 2007; Hakanen, Bakker & Demerouti, 2005) has shown that job resources such as appreciation, innovativeness, and skill variety are most predictive of work engagement when job demands (e.g., pupil misbehavior, unfavorable physical working environment) are high. Thus, job resources are particularly useful and motivating when needed. Proposition 5 is that personal resources such as optimism and self-efficacy play a similar role as job resources (see Figure 1). Personal resources refer to the beliefs people hold regarding how much control they have over their (work) environment. Individuals who are high in optimism and self-efficacy believe that good things will happen to them, and that they are capable of handling unforeseen events. Such beliefs help employees to actively approach their job demands and deal with them in an effective way. For example, our research has shown that health care nurses who feel optimistic and self-efficacious can translate emotionally demanding interactions with their patients into challenges so that they feel engaged in their work (Bakker & Sanz-Vergel, 2013). Additionally, when nurses realize they have many personal resources, they are better able to deal with possible hindrance job demands, such as bureaucracy and conflicts. As indicated in the opening paragraphs, most research in the domain of occupational health and well-being follows a stimulus-response model, thereby implicitly assuming that employees are passive and simply react to their working conditions. For example, the well-known demands-control model, effort-reward imbalance model, and job characteristics model (for a brief discussion, see Bakker & Demerouti, 2014) all assume that work characteristics influence employees, but do not explicate how employees may influence their own work environment. However, there is considerable evidence for the idea that employees play an active role in interpreting and modifying their working conditions. JD-R theory (Bakker & Demerouti, 2014, 2017) proposes that depending on their occupational health and well-being, employees may influence their own job design in one of two ways: (1) employees are stressed and influence their working environment in a negative way, inducing a loss cycle of job demands and strain; or (2) employees are engaged in their work and influence their working environment in a positive way, inducing a gain cycle of job resources and work engagement. These propositions are discussed in more detail below. In his conservation of resources theory, Hobfoll (1989) proposes that people who lack various types of resources (e.g., a home, time, money, knowledge) are susceptible to losing even more resources. The assumption is that resources are related to each other in a ‘web-like’ nature, and that resource loss occurs in spirals. Loss spirals will follow initial losses, with each loss resulting in depletion of resources for confronting the next threat or loss (Hobfoll, 2001). For example, in a study on coping with traumatic stressors, Heath, Hall, Russ, Canetti, and Hobfoll (2012) found that exposure to political violence resulted in the loss of important personal and social resources. Resources loss predicted psychological distress, which predicted further resource loss. It is important to note that resource loss also prevents the switching of the situation into gain cycles, because there are not enough resources to invest in order to gain new resources. For example, in the context of work, one could invest knowledge, energy, and time to learn new skills in order to qualify for a new job. JD-R theory refers to loss cycles, because loss spirals eventually imply a complete depletion of resources. In most work organizations, people always have access to some resources. However, they may end up in a vicious cycle of resource loss in which one problem leads to another that aggravates the previous problem. There is considerable evidence for loss cycles in an occupational context. Bakker, Schaufeli, Sixma, Bosveld, and Van Dierendonck (2000) found that general practitioners who had lost their enthusiasm and were more cynical towards their patients (cynicism) at the first wave of data collection faced more patient demands (complaints, threats) at the second wave five years later. In a similar vein, Ten Brummelhuis, Ter Hoeven, Bakker, and Peper (2011) found that financial consultants who had lost their enthusiasm and showed more burnout complaints reported a stronger increase in work overload, work hours, and work-home barriers over a period of two years. In a recent study, Frins, van Ruysseveldt, Van Dam, and Van den Bossche (2016) found that older employees who lost their energy, felt exhausted and wished to retire at an earlier age reported more time pressure and more hectic work one year later. Employees who experience high levels of job strain (e.g., chronic exhaustion) communicate poorly, make mistakes, and create conflicts, which add up to the already high job demands. Bakker and Costa (2014) have coined the term self-undermining to refer to “behavior that creates obstacles that may undermine performance” (p. 115). Proposition 7 in JD-R theory is that negative job strain leads to self-undermining behaviors, which result in higher levels of job demands, and even higher levels of job strain. Bakker and Wang (2016) showed that employees who engaged in self-undermining behaviors (i.e., created stress, confusion, and conflict) reported higher levels of work pressure and emotional demands, were more exhausted, and scored lower on supervisor-ratings of job performance. Thus, self-undermining seems the consequence of high levels of job strain, and is the fuel of a loss cycle of high job demands and job strain (see Figure 1). Longitudinal studies carried out in the past decade have also provided convincing evidence for gain cycles of job resources, well-being, and outcomes. For example, Hakanen, Perhoniemi and Toppinen-Tanner (2008) found that task-level job resources (craftsmanship, pride in the profession, and positive feedback from the results of work) predicted dentists’ work engagement, and that work engagement predicted personal initiative over a period of three years. In addition, there was evidence for reversed causal effects. Among others, personal initiative positively influenced work engagement, and work engagement had a positive impact on future job resources, suggesting a gain cycle. Similarly, Reis, Hoppe and Schröder (2015) followed psychotherapists over a period of five months, and found that work engagement was a predictor and outcome of job resources such as autonomy, task variety, and learning opportunities. In addition, they found that the relationship between work engagement and mental health was reciprocal. Thus, those who felt generally cheerful, active, rested, and interested at time 1 (T1) were more likely to be engaged at work at T2, and those who were engaged at work at T1 were more likely to report a better general mental health at T2. In their longitudinal study among engineers, Xanthopoulou, Bakker, Demerouti and Schaufeli (2009b) found that job resources predicted personal resources (self-efficacy, optimism, and self-esteem) and work engagement. They also found evidence for reversed causal effects from personal resources and work engagement to job resources – suggesting that those who were more self-efficacious, optimistic and enthusiastic at work gained more job resources over time. Finally, using a sophisticated study design with three waves of data collection, Weigl and his colleagues (2010) found that hospital physicians with higher levels of job control and active coping, and better work relationships at T1, felt more engaged at T2 (one year later). Work engagement, in turn, was a predictor of job control, active coping and high-quality work relationships at T3 (eighteen months later). Thus, T2 work engagement functioned as a mediator in the longitudinal relationship between T1 and T3 resources, suggesting a gain cycle of job resources. Taken together, these studies suggest that individuals who are engaged in their job are also motivated to stay engaged, and create their own resources (e.g., autonomy, feedback, support) over time. This idea is again consistent with conservation of resources theory (Hobfoll, 1989; 2001). Individuals are motivated to conserve their resources, and will try to expand these resources if possible. The question is how employees manage to optimize their own work environment. JD-R theory acknowledges employees as active creators by modeling the loss and gain cycles employees initiate at work. We already saw that employees who are too strained by their job demands will become exhausted and initiate a loss cycle. Their exhaustion increases the likelihood of self-undermining behaviors, which further increase job demands and exhaustion. In contrast, employees who are engaged at work are motivated to stay engaged. We suggest that these employees will proactively search for challenges in their work and for the resources needed to perform well. The latter behavior is called job crafting. Job crafting. According to Wrzesniewski and Dutton (2001), job crafting refers to the proactive changes employees make in their work tasks and their working relationships (e.g., with clients, colleagues, and their supervisor). The authors argue that job crafting may also refer to a cognitive process in which employees try to alter their view of work to make it more meaningful. In JD-R theory, we propose a behavioral approach, and argue that job crafting can take the form of proactively optimizing job demands and job resources (Tims, Bakker & Derks, 2012). More specifically, we propose that employees may increase their challenge job demands, increase their social and structural job resources, and decrease their hindrance job demands. A recent series of studies has indicated that job crafting can indeed lead to more job and personal resources and indirectly contribute to work engagement and job performance (see Figure 1; Demerouti, 2014, for an overview). Proposition 8 in JD-R theory is that employees who are motivated by their work are likely to use job crafting behaviors, which lead to higher levels of job and personal resources, and even higher levels of motivation. Research of the past five years has provided convincing evidence for this process. For example, Tims, Bakker and Derks (2013) found that job crafting in the form of seeking challenges and resources predicted an increase in job resources, and indirectly related to increases in work engagement and job satisfaction. Vogt, Hakanen, Brauchli, Jenny and Bauer (2016) showed with a longitudinal study that employees who proactively built a resourceful and challenging work environment for themselves, increased their own psychological capital (hope, resilience, self-efficacy, and optimism) and work engagement. Demerouti, Bakker, and Gevers (2015) showed that job crafting (particularly increasing job resources) was positively related to supervisor-ratings of contextual performance (i.e. helping others), through employee work engagement. In addition, job crafting was positively related to supervisor-ratings of creativity through work engagement and flourishing. Moreover, recent studies have shown that job crafting interventions in the form of training and self goal-setting can have favorable effects on employee well-being and job performance (Gordon et al., 2016; Van den Heuvel, Demerouti & Peeters, 2015; Van Wingerden, Bakker & Derks, 2016). Thus, employees can create their own ‘gain cycle’ of resources and work engagement by learning to craft their job. Unfortunately, however, most research seems to suggest that (self-initiated) job crafting in the form of reducing job demands is not an effective strategy to stop the loss cycle of high job demands and job strain (Demerouti, 2014). JD-R theory outlines the processes through which job demands and resources influence occupational health, organizational behavior, and job performance. Most JD-R research has investigated these processes at the individual, employee level. Thus, employees are asked to report about their own job demands and resources and well-being, and this is then related to (self- or other-ratings of) individual performance. When managers know which specific job demands and resources need attention, they may take strategic and structural measures so that the work process is optimized for the employees in a top-down fashion which results in a better quality of working life. In addition, we have seen that employees influence their own working conditions. Employees can be reactive and undermine themselves by creating more job demands, or they can be proactive and optimize their own job demands and resources. This bottom-up perspective does not replace but rather complements existing top-down approaches. Acknowledging the active roles of various stakeholders raises the question how the various stakeholders interact. Therefore, it is essential that scientists distinguish between various levels, namely the level of the organization at large or management, the leader, the team, and the individual. In what follows, we illustrate how organizations, leaders and teams influence individual employees (cross-level main and mediation effects), and how the various levels interact to enhance employee well-being and organizational performance (cross-level interaction effects). Figure 2 gives an overview of the multilevel processes that may play a role here. In a recent paper, Albrecht, Bakker, Gruman, Macey and Saks (2015) have outlined how organizations may influence employee work engagement and performance through human resource (HR) practices. They argue that four key engagement-related HR practices (employee selection, socialization, performance management, and learning and development; see number 1 in Figure 2) influence the organizational climate (number 2) and the job demands and resources experienced by employees in their work roles (number 5 and 8), and indirectly influence work engagement and performance outcomes (number 6 and 9). Research has indeed provided evidence for this cross-level process. For example, Alfes, Shantz, Truss and Soane (2013) found that human resource practices such as employment security, extensive training, decentralization of decision-making, and sharing of financial and performance information (number 1) were positively related to individual organizational citizenship behaviors through work engagement (number 9). Dollard and Bakker (2010) found that when Australian teachers and administrators perceived a psychological climate in their organization signaling that management takes care of their employees (i.e., psychosocial safety climate; number 2), employees reported more job resources and endurable job demands (number 8) – which resulted in higher levels of work engagement (number 9). In a similar vein, Idris, Dollard, and Yulita (2014) found in their study in the Malaysian private sector that psychosocial safety climate (number 2) had cross-level effects on employee perceptions of job design (emotional job demands; number 8) and indirectly reduced psychological problems (exhaustion and depression; number 9). Figure 2. Multiple levels in JD-R theory. Note. WB = Well-being. Feedback loops are not included to avoid overly complex modeling. Furthermore, Van Wingerden et al. (2016) showed that job crafting training initiated by the HR department (number 1) had consistent positive effects on employee job crafting behaviors (number 7), and indirectly influenced job demands, resources (number 8) and work engagement (number 9). In a similar vein, Gordon et al. (2016) showed that job crafting training (number 1) influenced nurses’ and surgeons’ job crafting behaviors (number 7), and improved job demands and resources (number 8), as well as objective ratings of job performance (number 9). As a final example, in an impressive study among more than 15,000 employees from more than 1200 workplaces, Croon, Van Veldhoven, Peccei and Wood (2015) found that job enrichment HR practices (number 1) indirectly influenced organizational productivity (number 3) through employee perceptions of job resources (job control; number 8) and job satisfaction (number 9). These findings indicate that organizations can use HR practices to optimize the design of the jobs they offer. HR practices such as performance development and skills training create an abundance of challenging job demands and job resources that fuel employee well-being and performance. How do leaders influence employees’ job demands and resources? According to transformational leadership theory (Bass, 1985), effective leaders are able to inspire their followers to invest effort in common goals. By using inspirational motivation, individual consideration, and intellectual stimulation, leaders can motivate their followers to use their personal strengths. In a series of studies, Breevaart and her colleagues investigated how leaders may influence the working environment of their employees and in this way indirectly influence employee work engagement and job performance. In one study, Breevaart et al. (2014) followed naval cadets during their 34-day voyage from Northern Europe to North America by sail ship. The results showed that transformational leaders (number 4) had a positive influence on cadets’ daily work engagement (number 9) because these leaders created abundant job resources for their followers (number 8). Naval cadets could use these resources to deal with the daily job challenges (e.g., hurricanes, complex exercises at sea). In a follow-up study among a heterogeneous sample of white-collar workers, these findings were expanded. Breevaart, Bakker, Demerouti, Sleebos, and Maduro (2014) found that transformational leadership (number 4) contributed to followers’ work engagement and leader-ratings of job performance (number 9) through job resources (autonomy, feedback, opportunities for growth; number 8). Similarly, Fernet, Trépanier, Austin, Gagné, and Forest (2015) investigated the impact of leadership on follower performance in their study among nurses and school principals. Consistent with JD-R theory, they found that transformational leadership (number 4) resulted in fewer job demands (cognitive, emotional and physical demands) and more job resources (e.g., participation in decision-making, job recognition, and quality of relationships; number 8), and indirectly contributed to more positive work attitudes and better job performance (number 9). In their study among Portuguese research teams, Costa, Passos and Bakker (2015) found that performance feedback, social support from co-workers, support from the supervisor, and information acted as team job resources (number 5) that predicted team work engagement (number 6) and objective research output (e.g., number of publications, number of oral presentations in conferences, organization of seminars/conferences, patents; number 6 and 9). Relationship conflict undermined the link between team resources and team work engagement, whereas task conflict aggravated the link between team work engagement and performance. These findings and the literature on teams clearly suggest that individual employees in work teams influence each other’s engagement and performance. There is indeed evidence for the crossover of work engagement between co-workers (e.g., Bakker, Van Emmerik & Euwema, 2006; Bakker & Xanthopoulou, 2009; link from number 5 to 8). Moreover, in their study among teams of occupational health professionals, Tims, Bakker, Derks, and Van Rhenen (2013) found that team work engagement (number 6) was related to individual performance through individual work engagement (number 9). Moreover, the latter study showed that employees were more likely to be proactive and improve their own job demands and resources, if they worked in teams where most others engaged in job crafting behaviors (see also Leana, Appelbaum, & Shevchuk, 2009). Bakker, Rodriguez Munoz and Sanz Vergel (2016) argue that employees imitate each other’s job crafting behaviors and therefore influence each other’s work engagement. The results of their study among dyads of employees from various companies showed indeed a reciprocal relationship between dyad members’ job crafting behaviors. Moreover, employee’s job crafting was related to colleague’s work engagement through colleague’s job crafting, suggesting a modeling process. As we saw in this review, it is important to differentiate between different organizational levels (organization, leader, team, individual), because the various stakeholders in organizations influence each other. Unfortunately, most research in organizational psychology is conducted at the individual level. Organizations are usually interested in average scores on job demands-resources, well-being, and performance at the team or departmental level. Therefore, researchers often aggregate individual scores to the group level. However, the aggregate of individual work engagement is phenomenologically different from team work engagement (Costa, Passos & Bakker, 2014). In addition, we have just seen that organizational life can better be explicitly modeled at various levels. This also offers the opportunity to investigate how the various levels statistically interact to produce occupational health and organizational performance (cross-level interaction effects). Studies in the area of human resource management have investigated the cross-level interaction between HR practices and job demands/job resources. Boon and Kalshoven (2014) found that high-commitment HR practices (number 1) such as continuous training, high job security, empowerment, job rotation, a focus on learning and developmental feedback, variable pay, and an extensive benefits package were positively related to work engagement and organizational commitment (number 9), when task proficiency was low – that is, under the condition that employees lacked the resources to handle their tasks (number 8). This suggests that HR practices can help to overcome a lack of resources. However, Jensen, Patel, and Messersmith (2013) found that high-performance work systems, which are aimed at creating a competitive advantage for organizations, do so at the expense of workers. Using a multilevel sample of 1,592 government workers nested in 87 departments, they found that HPWS had several negative consequences when implemented with low levels of job control. Specifically, Jensen and colleagues showed that HPWS contributed positively to employee role overload (number 8) and anxiety (number 9) when job control (number 8) was low. These findings clearly indicate that if the implementation of HPWS practices is not coupled with an appropriate increase in autonomy among individual employees, simply instating a bundled set of integrated HR practices may have undesirable effects on employee job demands and well-being. These results point at the interplay between factors from different levels. Using a general population sample of 2,343 Australian workers from a wide range of sectors, Hall, Dollard, Winefield, Dormann, and Bakker (2013) tested the buffering role of psychosocial safety climate as a macro-level resource in the health impairment process of the JD-R model. PSC refers to shared perceptions of organizational policies, practices, and procedures for the protection of worker psychological health and safety (Dollard & Bakker, 2010). When employees collectively believe that management takes good care of their health and safety, there is a high PSC. Hall and his colleagues found that PSC (number 2 in Figure 2) moderated the effects of (emotional and psychological) job demands (number 8) on depression (number 9), also after controlling for the impact of specific job resources (job control and social support). In a similar vein, Garrick et al. (2014) investigated the impact of general PSC in Australian schools on the link between teachers’ daily job demands and well-being. They found that PSC (number 2) buffered the impact of daily job demands (number 8) on fatigue (number 9), and boosted the impact of daily job demands (number 8) on work engagement (number 9). PSC also exerted a negative main effect on fatigue and a positive main effect on engagement. These findings suggest that organizations may be able to prevent worker depression and fatigue and foster work engagement when they focus on the development of a consistent PSC that signals a work environment conducive to worker psychological health and positive organizational behaviors. Breevaart and Bakker (in press) hypothesized that daily transformational leadership behavior boosts employee work engagement on days characterized by high challenge job demands, and protects work engagement on days characterized by high hindrance job demands. Teachers filled out a short online questionnaire at the end of each workday during a two-week period. Results showed that teachers’ daily challenge demands (workload and cognitive demands; number 8) had a positive relationship with work engagement (number 9) on the days transformational leadership (number 4) was high (vs. low). In addition, teachers’ daily hindrance demands (role conflict; number 8) had a negative relationship with work engagement (number 9) on the days transformational leadership (number 4) was low (vs. high). These findings suggest that leaders use inspiration, intellectual stimulation and individual consideration to help followers to deal with their daily job demands. Wang, Demerouti, LeBlanc, Bakker and Jiang (2017) investigated how Chinese leaders empower their followers so that they optimize their own working conditions and feel well (i.e. job crafting). They conducted a diary study among 106 leader-follower dyads (HR managers, consultants, engineers, and programmers) that had work contact on a daily basis. Wang and colleagues found that proactive leaders were most likely to show empowering behaviors, by consulting, delegating, enabling, and informing their followers. Further, the results showed that on the days leaders used more empowering behaviors (number 4), followers were more likely to engage in job crafting – i.e. to seek job challenges and resources, and to reduce hindrance demands (number 7). Moreover, daily empowering behaviors of leaders were particularly important for follower job crafting on the days followers had limited autonomy (number 8). These findings highlight that the interplay between leaders’ behavior and individual job characteristics influences individual employee outcomes. Although JD-R theory provides answers to many issues regarding (occupational) well-being, there are several issues that need further attention. We will zoom in on three of these issues. First, although we know that job characteristics and well-being are related in the form of cycles or spirals (Salanova, Schaufeli, Xanthopoulou, & Bakker, 2010), we do not really know why this is the case. Why do individuals who are exhausted continue to find themselves in a negative cycle and not turn the negative cycle into a positive cycle? Similarly, how do individuals who are engaged in their job manage to remain in a positive cycle? Do such cycles lead to increases or decreases in the levels of well-being (i.e. higher levels of exhaustion or engagement), or do cycles generally keep the levels of well-being constant? We also do not know whether it is possible, and, if so, how individuals may change the progress of a negative cycle and turn it into a positive one. These questions not only require longitudinal data that allow testing cycles and spirals over time, but also advanced theory. Second, we suggest in JD-R theory that well-being and performance are the outcomes of factors at the individual (job function) level but also at the team or even the organizational level. Several studies have provided evidence for such a claim. However, the empirical evidence is still scarce and scattered. We need more empirical evidence regarding whether a factor at the organizational level consistently acts as buffer or exacerbator of the effects on lower levels, or whether main effects are more important, for instance that a HRM policy directly influences the well-being of an individual. In addition, and in line with Bakker (2015), multilevel theories may differentiate between trait and state variables, integrate employee personality in the model, and outline how stable and dynamic variables interact. From a theoretical point of view, multi-level constructs result in a better understanding of psychological phenomena unfolding within organizations. From a practical point of view, knowledge gathered by following a multi-level approach can help guide the development of more effective interventions. We do not only need more systematic research on cross-level effects, but we also need better theoretical arguments explaining why and how factors at the higher level of the organization are important for processes occurring at the lower level. Third, we have recently integrated employee behaviors in JD-R theory and have shown how employees may modify their job demands and resources through job crafting and self-undermining. In this chapter, we focused explicitly on self-undermining (involved in the negative cycle) and job crafting (involved in the positive cycle). Demerouti (2015) suggests that individuals may use various strategies – methods or plans that people choose to achieve a goal or solve a problem, which generally involve some planning or marshaling of resources for their most efﬁcient and effective use. According to Demerouti, examples of such strategies are coping, recovery from work-related effort, as well as selection, optimization, and compensation. Additionally, strength use (van Woerkom, Oerlemans, & Bakker, 2016) and proactive vitality management (Op den Kamp, Tims, Bakker, & Demerouti, 2017) may be important for the development of well-being. Integrating individual strategies into JD-R theory has both theoretical and practical implications and may uncover which behaviors help individuals to function well in a specific work context. These behaviors can then be stimulated or trained (see also, Bakker, 2017). JD-R theory has been shown to be particularly influential in organizational practice as it helps practitioners and organizations to recognize the factors related to well-being (health and motivation) and to optimal functioning. Given the complexity of contemporary jobs, recognizing the demands and resources that may harm health or diminish motivation is one important but not sufficient step for improving well-being. Based on JD-R theory, we think that several steps are necessary in order to influence organizational life positively. First, regular monitoring of the prevailing job demands and resources as well as of well-being is essential in order to recognize possible problems that require action. Second, as suggested, organizational level factors (HR practices, organizational climate) but also team-level factors (leaders’ behavior, team demands and resources) may influence processes at the lower level. Therefore, constantly improving work processes and introducing employee friendly and high performance practices represent top-down interventions that can be beneficial for both the individual employee and organizational performance. In addition, training of supervisors to help them generate resources for their employees and teams to be resourceful to each other is a possible intervention at the middle level. Third, we showed that in addition to managers also individual employees influence the conditions at work such that these conditions are optimized. Training employees to redesign their own jobs such that these jobs are better tailored to employees’ preferences and abilities (through job crafting trainings; Van den Heuvel et al., 2015; Van Wingerden et al., 2016) may complement top-down approaches and make them even more effective. In order to achieve this, organizations need to enhance the relevant skills of their employees (through training or role modeling), and give employees the decision-authority to engage in job crafting. In this chapter, we presented JD-R theory, which is appropriate to specify the factors that are related to the well-being of individual employees. Central in this theory are the prevailing job demands and job resources, which are responsible for health and motivational outcomes, respectively. However, we also provided evidence that the well-being of individuals triggers them to influence their job demands and resources (cf. job crafting and self-undermining), and these bottom-up influences operate next to the top-down changes initiated by the organization or its leaders. Moreover, we discussed that these processes occur over time in the form of positive or negative cycles, and that factors from different levels of the organization are involved in these processes. Although further research is needed to test its propositions, JD-R theory has clear implications for practice. We hope that JD-R theory will continue to inspire researchers and practitioners in organizations who aim to improve employee well-being and effective organizational functioning. Albrecht, S., Bakker, A. B., Gruman, J., Macey, W., & Saks, A. (2015). Employee engagement, human resource management practices and competitive advantage: An integrated approach. Journal of Organizational Effectiveness: People and Performance, 2, 7-35. Alfes, K., Shantz, A., Truss, C., & Soane, E. (2013). The link between perceived human resource management practices, engagement and employee behaviour: A moderated mediation model. The International Journal of Human Resource Management, 24, 330-351. Bakker, A. B. (2015). Towards a multilevel approach of employee well-being. European Journal of Work and Organizational Psychology, 24, 839-843. Bakker, A. B. (2017). Strategic and proactive approaches to work engagement. Organizational Dynamics, 46, 67-75. Bakker, A. B., & Costa, P. (2014). Chronic job burnout and daily functioning: A theoretical analysis. Burnout Research, 1, 112–119. Bakker, A. B., & Demerouti, E. (2014). Job Demands–Resources theory. In C. Cooper & P. Chen (Eds. ), Wellbeing: A complete reference guide (pp. 37-64). Chichester, UK: Wiley-Blackwell. Bakker, A. B., & Demerouti, E. (2017). Job Demands–Resources theory: Taking stock and looking forward. Journal of Occupational Health Psychology, 22, 273-285. Bakker, A. B., Demerouti, E., & Euwema, M. C. (2005). Job resources buffer the impact of job demands on burnout. Journal of Occupational Health Psychology, 10, 170-180. Bakker, A. B., Hakanen, J. J., Demerouti, E., & Xanthopoulou, D. (2007). Job resources boost work engagement, particularly when job demands are high. Journal of Educational Psychology, 99, 274-284. Bakker, A. B., Rodriguez-Munoz, A., & Sanz-Vergel, A. I. (2016). Modelling of job crafting behaviours: Implications for work engagement. Human Relations, 69, 169-189. Bakker, A. B., & Sanz-Vergel, A. I. (2013). Weekly work engagement and flourishing: The role of hindrance and challenge demands. Journal of Vocational Behavior, 83, 397–409. Bakker, A. B., Schaufeli, W. B., Sixma, H., Bosveld, W., & Van Dierendonck, D. (2000). Patient demands, lack of reciprocity, and burnout: A five-year longitudinal study among general practitioners. Journal of Organizational Behavior, 21, 425-441. Bakker, A. B., Van Emmerik, IJ.H., & Euwema, M. C. (2006). Crossover of burnout and engagement in work teams. Work & Occupations, 33, 464-489. Bakker, A. B., Van Emmerik, H., & Van Riet, P. (2008). How job demands, resources, and burnout predict objective performance: A constructive replication. Anxiety, Stress, and Coping, 21, 309-324. Bakker, A. B., Van Veldhoven, M. J. P. M., & Xanthopoulou, D. (2010). Beyond the Demand-Control model: Thriving on high job demands and resources. Journal of Personnel Psychology, 9, 3-16. Bakker, A. B., & Wang, Y. (2016). Self-undermining behavior at work: Evidence of construct and predictive validity. Manuscript submitted for publication. Bakker, A. B., & Xanthopoulou, D. (2009). The crossover of daily work engagement: Test of an actor-partner interdependence model. Journal of Applied Psychology, 94, 1562–1571. Boon, C., & Kalshoven, K. (2014). How high-commitment HRM relates to engagement and commitment: The moderating role of task proficiency. Human Resource Management, 53, 403–420. Breevaart, K., & Bakker, A. B. (in press). Daily job demands and employee work engagement: The role of daily transformational leadership behavior. Journal of Occupational Health Psychology. Breevaart, K., Bakker, A. B., Demerouti, E., Sleebos, D. M., & Maduro, V. (2014). Uncovering the underlying relationship between transformational leaders and followers’ task performance. Journal of Personnel Psychology, 13, 194-203. Breevaart, K., Bakker, A. B., Hetland, J., Demerouti, E., Kjellevoldd-Olsen, O., & Espevik, R. (2014). Daily transactional and transformational leadership and daily employee engagement. Journal of Occupational and Organizational Psychology, 87, 138-157. Costa, P., Passos, A., & Bakker, A. B. (2014). Empirical validation of the team work engagement construct. Journal of Personnel Psychology, 13, 34–45. Costa, P., Passos, A., & Bakker, A. B. (2015). Direct and contextual influence of team conflict on team resources, team work engagement and team performance. Negotiation and Conflict Management Research, 8, 211-227. Croon, M. A., Van Veldhoven, M. J. P. M., Peccei, R. E., & Wood, S. (2015). Researching individual well-being and performance in context: Multilevel mediational analysis for bathtub models. In M. J. P. M. van Veldhoven, & R. Peccei (Eds. ), Well-being and performance at work: The role of context (pp. 129-154). Hove: Psychology Press. De Jonge, J., & Dormann, C. (2006). Stressors, resources, and strain at work: A longitudinal test of the triple-match principle. Journal of Applied Psychology, 91, 1359-1374. Demerouti, E. (2014). Design your own job through job crafting. European Psychologist, 19, 237–247. Demerouti, E. (2015). Strategies used by individuals to prevent burnout. European Journal of Clinical Investigation, 45, 1106-1112. Demerouti, E., Bakker, A. B., & Gevers, J. (2015). Job crafting and extra-role behavior: The role of work engagement and flourishing. Journal of Vocational Behavior, 91, 87-96. Demerouti E., Bakker, A. B., Nachreiner, F., & Schaufeli, W. B. (2001). The Job Demands - Resources model of burnout. Journal of Applied Psychology, 86, 499-512. Fernet, C., Trépanier, S., Austin, S., Gagné, M., & Forest, J. (2015). Transformational leadership and optimal functioning at work: On the mediating role of employees' perceived job characteristics and motivation. Work & Stress, 29, 11-31. Frins, W., Van Ruysseveldt, J., Van Dam, K., Van den Bossche, S. N. J. (2016). Older employees’ desired retirement age: A JD-R perspective. Journal of Managerial Psychology, 31, 34-49. Garrick, A., Mak, A. S., Cathcart, S., Winwood, P.C., Bakker, A.B., & Lushington, K. (2014). Psychosocial safety climate moderating the effects of daily job demands and recovery on fatigue and work engagement. Journal of Occupational and Organizational Psychology, 87, 694-714. Gordon, H., Demerouti, E., LeBlanc, P., Bakker, A. B., Bipp, T., & Verhagen, M. (2016). Bottom-up job (re)design: The impact of job crafting interventions on work engagement and performance. Manuscript submitted for publication. Hakanen, J. J., Bakker, A. B., & Demerouti, E. (2005). How dentist scope with their job demands and stay engaged: The moderating role of job resources. European Journal of Oral Sciences, 113, 479-487. Hakanen, J. J., Perhoniemi, R., & Toppinen-Tanner, S. (2008). Positive gain spirals at work: From job resources to work engagement, personal initiative and work-unit innovativeness. Journal of Vocational Behavior, 73, 78-91. Hall, G.B., Dollard, M.F., Winefield, A.H., Dormann, C., & Bakker, A.B. (2013). Psychosocial safety climate buffers effects of job demands on depression and positive organizational behaviors. Anxiety, Stress, and Coping, 26, 355-377. Heath, N. M., Hall, B. J., Russ, E. U., Canetti, D., & Hobfoll, S. E. (2012). Reciprocal relationships between resource loss and psychological distress following exposure to political violence: An empirical investigation of cor theory’s loss spirals. Anxiety Stress Coping, 25, 679–695. Hobfoll, S. E. (2001). The influence of culture, community, and the nested-self in the stress process: Advancing conservation of resources theory. Applied Psychology: An International Review, 50, 337-370. Hopstaken, J. F., Van der Linden, D., Bakker, A. B., & Kompier, M. A. J. (2015). A multifaceted investigation of the link between mental fatigue and task disengagement. Psychophysiology, 52, 305-315. Hopstaken, J. F., Van der Linden, D., Bakker, A. B., Kompier, M. A. J., & Leung, Y. K. (2016). Shifts in attention during mental fatigue: Evidence from subjective, behavioral, physiological, and eye-tracking data. Journal of Experimental Psychology: Human Perception and Performance, 42, 878-889. Idris, M. A., Dollard, M. F., & Yulita (2014). Psychosocial safety climate, emotional demands, burnout, and depression: A longitudinal multilevel study in the Malaysian private sector. Journal of Occupational Health Psychology, 19, 291-302. Jensen, J. M., Patel, P. C., & Messersmith, J. G. (2013). High-performance work systems and job control consequences for anxiety, role overload, and turnover intentions. Journal of Management, 39, 1699-1724. Leana, C., Appelbaum, E., & Shevchuk, I. (2009). Work process and quality of care in early childhood education: The role of job crafting. Academy of Management Journal, 52, 1169–1192. LePine, J. A., Podsakoff, N. P., & LePine, M. A. (2005). A meta-analytic test of the challenge stressor– hindrance stressor framework: An explanation for inconsistent relationships among stressors and performance. Academy of Management Journal, 48, 764 –775. Op den Kamp, E., Tims, M., Bakker, A. B., & Demerouti, E. (2017). Enhancing well-being and creative work performance by mobilizing ego resources. Manuscript submitted for publication. Reis, D., Hoppe, A., & Schröder, A. (2015). Reciprocal relationships between job resources, personal resources, work engagement and health: Evidence for gain cycles. European Journal of Work and Organizational Psychology, 24, 59–75. Salanova, M., Schaufeli, W. B., Xanthopoulou, D., & Bakker, A. B. (2010). Gain spirals of resources and work engagement. In A. B. Bakker & M. P. Leiter (Eds. ), Work engagement: A handbook of essential theory and research (pp. 118-131). New York: Psychology Press. Schaufeli, W. B., & Bakker, A. B. (2004). Job demands, job resources, and their relationship with burnout and engagement: A multi-sample study. Journal of Organizational Behavior, 25, 293-315. Ten Brummelhuis, L. L., Ter Hoeven, C. L., Bakker, A. B., & Peper, B. (2011). Breaking through the loss cycle of burnout: The role of motivation. Journal of Occupational and Organizational Psychology, 84, 268–287. Tims, M., Bakker, A. B., & Derks, D. (2012). Development and validation of the job crafting scale. Journal of Vocational Behavior, 80, 173-186. Tims, M., Bakker, A. B., & Derks, D. (2013). The impact of job crafting on job demands, job resources, and well-being. Journal of Occupational Health Psychology, 18, 230-240. Tims, M., Bakker, A. B., Derks, D., & Van Rhenen, W. (2013). Job crafting at the team and individual level: Implications for work engagement and performance. Group and Organization Management, 38, 427–454. Van den Heuvel, M., Demerouti, E., & Peeters, M. C. W. (2015). The job crafting intervention: Effects on job resources, self-efficacy, and affective well-being. Journal of Occupational and Organizational Psychology, 88, 511-532. Van Wingerden, J., Bakker, A. B., & Derks, D. (2016). A test of a Job Demands–Resources intervention. Journal of Managerial Psychology, 31, 686-701. Van Woerkom, M., Oerlemans, W., & Bakker, A. B. (2016). Strengths use and work engagement: A weekly diary study. European Journal of Work and Organizational Psychology, 25, 384-397. Vogt, K., Hakanen, J. J., Brauchli, R., Jenny, G. J., & Bauer, G. F. (2016). The consequences of job crafting: A three-wave study. European Journal of Work and Organizational Psychology, 25, 353–362. Wang, H. J., Demerouti, E., LeBlanc, P., Bakker, A. B., & Jiang, F. (2017). Empowering employees on a daily basis: How leader proactivity shapes follower daily job crafting. Manuscript submitted for publication. Weigl, M., Hornung, S., Parker, S. K., Petru, R., Glaser, J., & Angerer, P. (2010). Work engagement accumulation of task, social, personal resources: A three-wave structural equation model. Journal of Vocational Behavior, 77, 140-153. Xanthopoulou, D., Bakker, A. B., Demerouti, E., & Schaufeli, W. B. (2009a). Work engagement and financial returns: A diary study on the role of job and personal resources. Journal of Occupational and Organizational Psychology, 82, 183-200. Xanthopoulou, D., Bakker, A. B., Demerouti, E., & Schaufeli, W. B. (2009b). Reciprocal relationships between job resources, personal resources, and work engagement. Journal of Vocational Behavior, 74, 235-244. Xanthopoulou, D., Bakker, A. B., Dollard, M.F., Demerouti, E., Schaufeli, W. B., Taris, T. W., & Schreurs, P. J. G. (2007). When do job demands particularly predict burnout? The moderating role of job resources. Journal of Managerial Psychology, 22, 766-786.